The Keeper (Item No. 51203/2), is a hybrid of two "Star Trek" aliens. This figure shares its name with the Talosian designated as The Keeper (from the episode "The Cage" or "The Menagerie"--take your pick), but possesses a head and robe that bears a striking resemblance to Balok's viewscreen "puppet" from "The Corbomite Manuever." 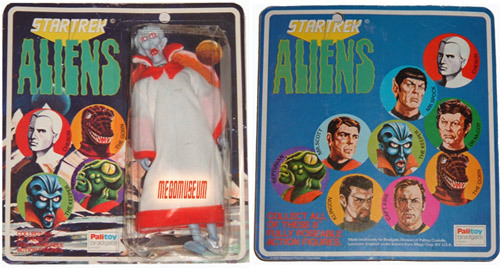 Mego would revisit the Talosian theme in their third series of figures. 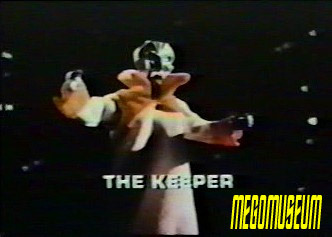 The Keeper was a logical choice as his visage appeared in the end credits for Star Trek, he was easily recognized even by those who hadn't seen the episode. 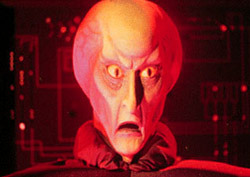 The head sculpt is adequately otherworldly, and, as mentioned previously, is an interesting echo of Balok's puppet. The body of this figure is a standard Type 2 male, but is cast entirely in powder-blue (a body shared with another "Trek" Alien: the Andorian). 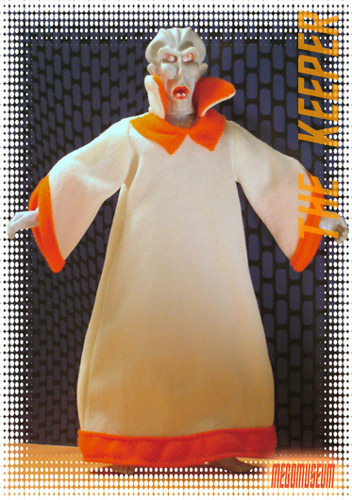 The figure came outfitted in a white robe with a large collar; the sleeves, collar and hem were all trimmed in orange. Due to the total lack of accessories, and the presence of only one article of clothing, this Alien is, hands-down, the easiest to find loose and complete. However, since his robe is white, it almostALWAYS has a stain or soiling of some kind. 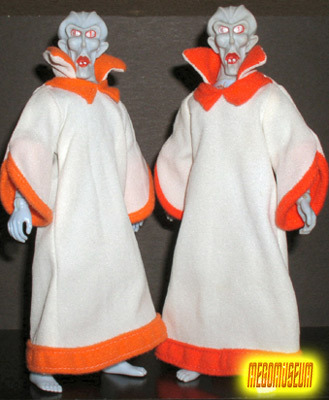 The Keeper's robe came in two different shades of orange: light-orange (left) and dark-orange (right). The difference is subtle, but they are definitely two different colors. However, it is difficult to tell which shade a particular Keeper has without the other shade with which to compare it. Generally speaking, the light-orange-robed Keepers seem to come on the "10-back" cards, while the dark-orange-robed Keepers tend to be found on the "14-backs." This further suggests that the light-orange was the first robe manufactured, while the dark-orange was last. Above we have a Keeper on a "10-back" card. This specimen is wearing the lighter Orange robe. Above we have a Keeper on a "14-back" card (considerably rarer than the "10-back"). This specimen is wearing the dark-orange style of robe. 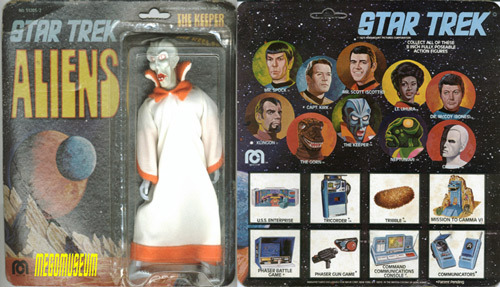 Note the broken legs; Keeper figures (and Andorians) are notorious for having broken knee joints, even inside sealed packages. Above we have a Keeper on a UK-exclusive Palitoy package. Noticeably different from its American counterpart, these cards are extremely rare, bold, beautiful, and highly desired--an extremely expensive mixture, to be sure. 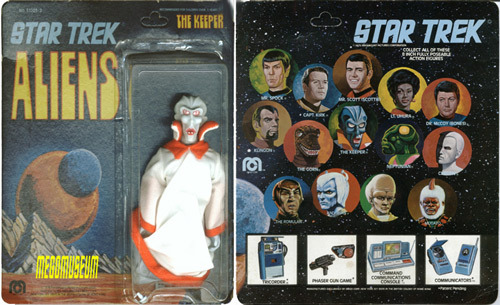 All four of the second series figures (Neptunian, Keeper, Gorn, Cheron) were available on this card in the UK.